Featuring a fitted, body hugging top with a flared bottom skirt starting at the waist, this flared dress is ready to move with you from office to dance floor. Processing time: Order verification, tailoring, quality check and packaging. All orders are sent to the Fulfillment Company for dispatch within 24 hours after the order is placed. The Fulfillment Company and the Shipping Company process the orders, which takes an additional 2–4 days. Shipping time: This refers to the time it takes for items to be shipped from our warehouse to the destination.International delivery usually takes about 15–30 business days. Canadian orders are shipped by Canada Post. US & International orders are shipped by DHL Global. After processing and leaving the warehouse, items usually take between 7 and 14 days to arrive at their destination but can take longer from time to time. 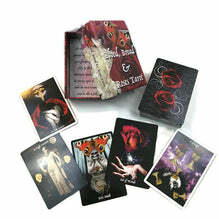 Blood Bread & Roses Tarot Available NOw! Complimentary single card readings for all customers. Combined shipping cost for all items.